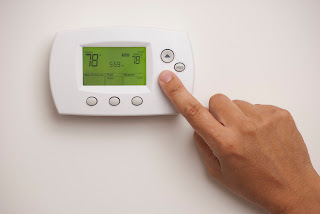 BLOCK REAL ESTATE SERVICES, LLC BLOG: 10 Ways CRE Professionals Can Be Energy Efficient! Here they are operational and management strategies that will help reduce energy consumption and elevating sustainability and even better many of them are no- or low-cost. Measure and Manage. Benchmark energy and water consumption through ENERGY STAR(R) Portfolio Manager. Audit Yourself. Perform regular energy audits to identify opportunities for cost-effective energy reductions. Remember to perform midnight evaluations to make sure lighting and HVAC aren't running when the building is unoccupied. Get the Word Out. Institute a Tenant Energy Awareness Program -- use your company newsletter and/or building announcements to keep tenants informed about energy management goals and how they can help. Provide them with energy savings tips. Become Enlightened. Replace incandescent lights with CFLs, which use less energy, have a longer lamp life and produce less heat. Go Low Flow. Install low-flow/flush fixtures and hands-free fixtures in restrooms. Don't Forget Electronics. Hold an e-waste day and collect old printers, computers and electronics for recycling. Use Sensors. Install occupancy sensors and photo sensors that monitor daylight. Occupancy sensors also work for HVAC controls. Be Shady. Install solar shades to block heat. Encourage Eco-Friendly Transportation. Install bicycle racks and electronic vehicle chargers. Improve IAQ. Use high-efficiency HVAC filters -- and change them often. Use low-VOC paints, sealants and adhesives for building improvements. Block Real Estate Services is a proud supporter of BOMA. Let us think on what other things we can do for our Real Estate Investing Australia. There are lots of new ways that professionals have discovered. New ways that would be easy to follow. Hope that you can learn also about it. It would make it easy for you if you learn the new ways.